Musical Fidelity reintroduces M6 PRE and PRX pre/power amplifiers | What Hi-Fi? Now owned by Pro-Ject Audio Systems (as of this summer), Musical Fidelity has been given a new lease of life. Last month the brand announced the new two-strong M2 range (which comprises the M2si stereo amplifier and M2sCD CD player), and now it’s lifted the lid on the imminent return of two classic Musical Fidelity products: the M6 PRE pre-amp and PRX power amplifier. 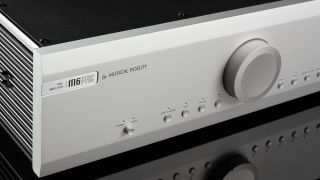 It’s been a while since the M6 series has featured a separate pre/power amp combo, but next month this new solution will join the M6 DAC, M6 Vinyl and M6 Encore Connect. Available in silver or black finishes, they can be bought separately (M6 PRE: £1,899, M6 PRX: £2,599), or for a special bundle price of £4000 - a saving of £500. The M6 PRE is a fully balanced pre-amplifier with a Class A design, low-impedance output stages (both single ended and full balanced) for driving any power amp, and a range of inputs: two balanced XLR inputs, four unbalanced RCA, an asynchronous USB (24-bit/96kHz) and a switchable MM/MC phono stage. There is also the added convenience of a switchable RCA input for home theatre bypass, a fixed tape loop, and both RCA and XLR outputs for connecting to a power amplifier like its partner-in-crime M6 PRX. A fully-balanced dual-mono power amp, the M6 PRX delivers 230 watts per channel, and, as expected in the face of its sibling, features both XLR and RCA inputs. There's also an RCA Loop output allowing it to be slotted into a bigger system. It utilises Musical Fidelity’s proprietary dual-mono bifilar choke regulation system, which is has been using since 1987 and is designed to reduce power supply noise. Musical Fidelity claims low levels of wide-band distortion and output impedance, as well as high peak current delivery, from its latest power amp, which unsurprisingly the brand says works ideally with the M6 PRE.